Part of 150th Gannenmono in Concert. In collaboration with Ukwanshin Kabudan, join us for a special performance featuring special guests from Ryūkyū. 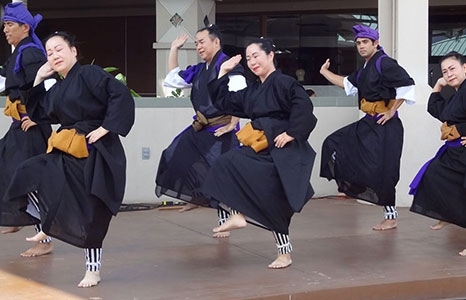 Kazue Higa—Master Instructor and granddaughter of Kiyoko Higa, founder of Ryuseikai Honryu Ryūkyū Dance School in Okinawa—and Atsuko Tamagusuku—Master Instructor and founder of the Udui Fukura Okinawan Dance School—joins the Ukwanshin Kabudan, a Ryukyu/Okinawa performing arts troupe based in Hawai`i, to present traditional and original performances in honor of Jūguya, the Mid Autumn Moon Festival (十五夜、中秋月祭). Shihan, Master Instructor and grand daughter of Kiyoko Higa, founder of Ryuseikai Honryu Ryūkyū Dance School in Okinawa. Kazue Higa is an accomplished artist of kumi udui, Okinawan classical music and dance plays, as well as Okinawan shibai, or folk plays. Her signature dance is wūbichi, a classical dance passed through her grandmother. Higa has travelled extensively throughout Japan, Europe, US and Hawaiʻi. She is recognized by the Okinawan and Japanese governments as a Traditional Ryūkyū Dance Artist for helping to preserve the traditional dance art of Okinawa. Kaishu, Master Instructor and founder of the Udui Fukura Okinawan Dance School. Atsuko is an accomplished artist in the Files of Kumi Udui and Okinawa shibai, and is well-recognized by the Okinawa and Japanese government for the preservation of the Ryūkyū traditional Performing Arts. She has also travelled throughout the US, Europe, Japan and Hawaiʻi.